search of an invigorating holiday set between unspoilt nature, excellent food and wine experiences and endless relaxation. 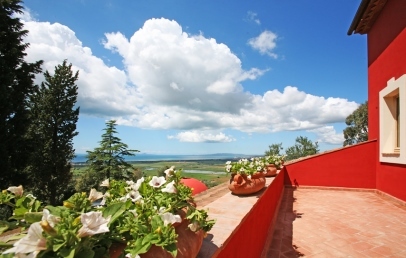 At 150 m above sea level, Poggio La Forcola is home to the Relais Vedetta, offering guests spectacular views over the Gulf of Follonica. 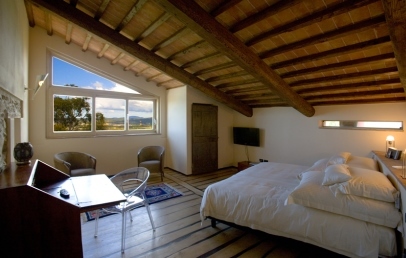 The scenery is typical of the Maremma region: 4 km from Scarlino, the Relais is surrounded by some 15 hectares of unspoilt woodland and a large olive grove belonging to the hotel. 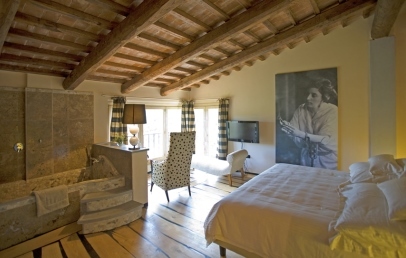 An ancient residence of the Barberini family, Relais Vedetta preserves the memory of the personages that inhabited it in the past. Welcoming yet reserved, this boutique hotel couples the peacefulness of nature with the call of the sea, always before the eyes of guests: from breakfast on the patio to cocktails at sunset, the spectacular view of the Gulf of Follonica will accompany your vacation. The beautiful pool also faces the sea, offering romantic sunsets over the Tuscan Archipelago. Painstaking renovation work has preserved the antique ceilings in tile and wood, a comforting haven in which the creative genius of the lady of the house has been given full rein: each suite tells a story, made of chests and old suitcases, leather sofas and appealing dormeuses, desks from the 19th century and old typewriters. Large and welcoming, rooms are equipped with all modern comforts: king-size beds, air conditioning, complimentary Wi-Fi connection, satellite TV with SKY channels, safe, kettle with an assortment of herbal teas, bathrobe, and olive-oil based complimentary toiletries. The breakfast is served until midday and offers organic produce from local farms, cakes and biscuits made in the hotel and special foods for guests with allergies or dietary requirements (on request). 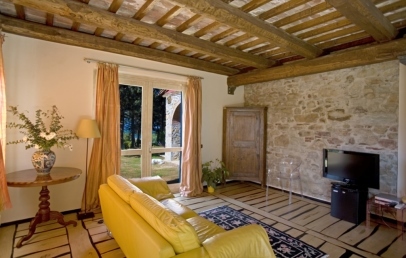 In the living room of the villa the guests of the resort can daily enjoy fresh fruit, flavored water and house wine. Guests can use free of charge the Wi-Fi connection throughout the building and have free access to common areas. With payment of a supplement, you can enjoy a series of additional services such as massages, horse-riding, visits to local wineries, rental of bicycles and inflatables, and private beach umbrella on the Carbonifera beach. Welcoming and reserved, the Dependance Suite is in a slightly isolated position and enjoys the privacy of looking over the villa garden. The ensuite bathroom is finished with a tub in glass mosaic. Intimate and precious, the first Deluxe Suite has a large window and balcony facing the greenery of the yews and oaks which surround the estate. 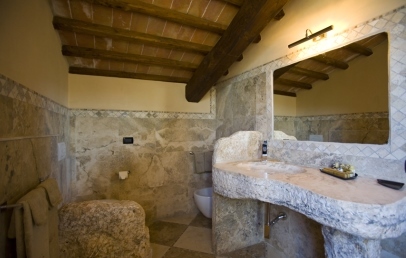 The en-suite bathroom has a tub in travertine stone. 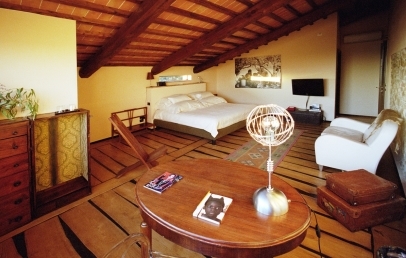 The second Deluxe Suite is on the second floor, and through a large window looks out over the Gulf of Follonica. 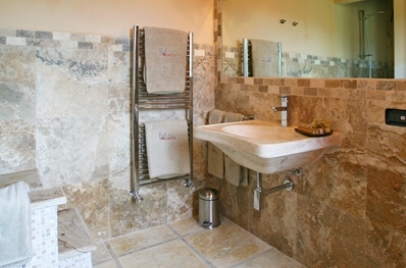 The ensuite bathroom is stone-tiled in warm colours. 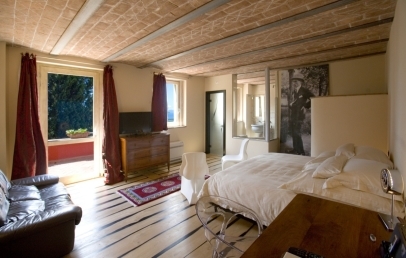 Situated on the second floor, this romantic attic room has a large window looking out over the Gulf of Follonica. The ensuite bathroom has a tub in travertine stone mosaic. 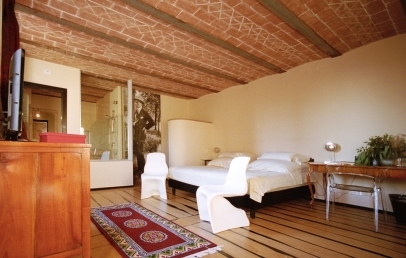 Large spaces and warm colours, the Prestige Suite is on the ground floor of the villa. 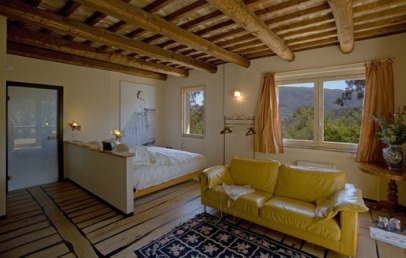 It has a spacious living room area and en suite bathroom with large tubs in travertine stone mosaic. 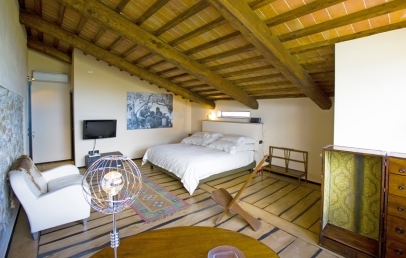 Stylish and welcoming, the Executive Suites are marked by a large private terrace with an all-round view reaching from the mountains to the inlets of Elba Island. This room is smaller, compared to the other rooms, with a small bathroom with shower. 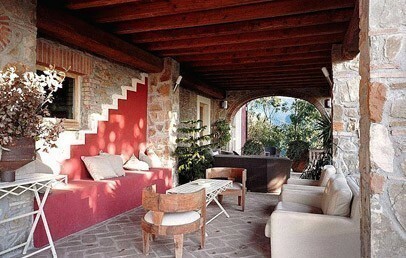 The characteristic of this room is the private garden terrace of 20 m² surface overlooking the garden. This accommodation is a good choice for a couple or it can be combined with a Suite Prestige with private garden, best suited for a family. 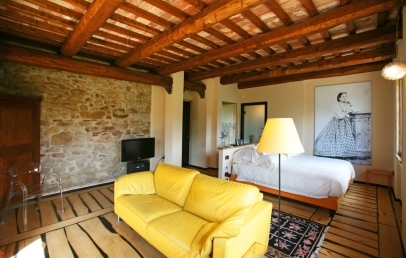 Book at least 5 nights and the last one is free of charge + welcome aperitif!